Here are some lovely floral dressds from the 1950's. I have a dress from a late 50's pattern with a black bodice and a black/white printed skirt. Heh. 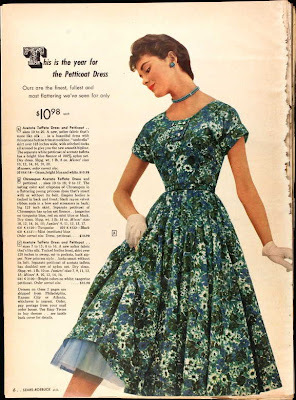 I've been coveting a floral 50's dress for ages and ages, my students keep making them and I keep wishing I had some floral like that in stash. Sigh. 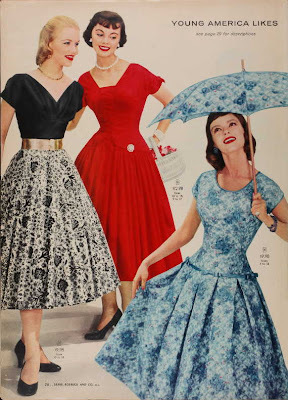 I love the one with a black bodice and a black & white skirt (so, Steph - lucky you). But I have to agree about that matching umbrella- adorable! Oooh! Such gorgeous dresses! I think my favorite is the one on the far right, third picture down. The bodice (as you pointed out ;) is fantastic. Thanks for sharing these! I think my favorite is the yellow dress from the second picture down - so pretty! I am also envious of Steph's lovely black bodice/black and white skirt dress because the dress seen here is absolutely gorgeous! 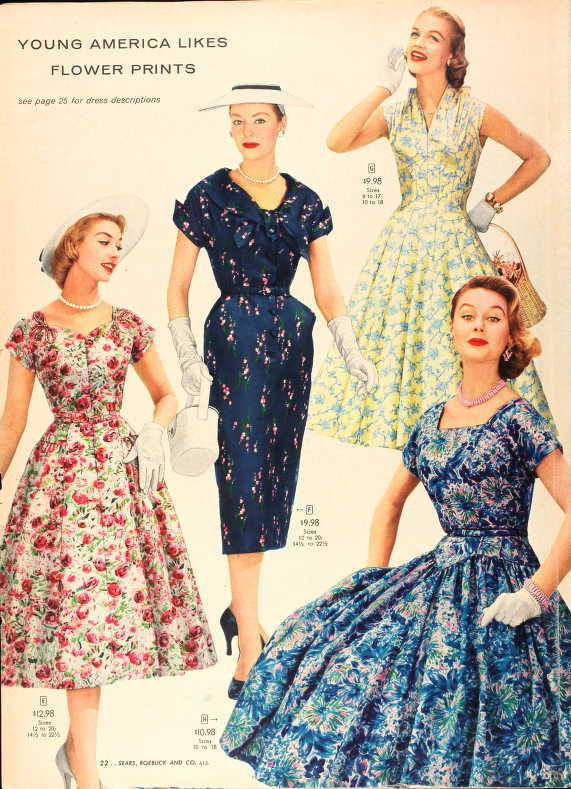 I'm partial to the navy one with a pencil skirt and small pink floral print, in the second picture. But they're all gorgeous and the prints are just so great! I love the red rose dress from 1956. So pretty! I love the pale yellow one and the one with the black bodice and the stripy large-scale flower pattern. Did I make myself understood !!!!!!!!!!!!! I love the black top + b/w skirt + gold belt! What a lovely combo. I also love the expressions on some of those ladies faces! Debi -- this is so fun! I love, love, love this era, too. Maybe because I was born then and remember my mother, a wonderful seamstress, making her own clothes and looking terrific in them! The really wonderful thing is that YOU look terrific in these fashions! Although I love the styles, I do not have the body style to wear any of it! 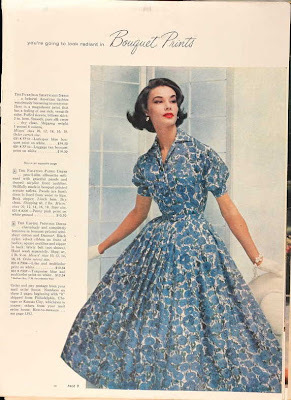 I'm so glad there are women out there who take up craft and look awesome in the fashion -- not at all looking "out of time" but classic and stylish! Fun stuff! The first one is a real winner for me. So beautiful! I love the first one best, but then I have a thing for teal shadings. 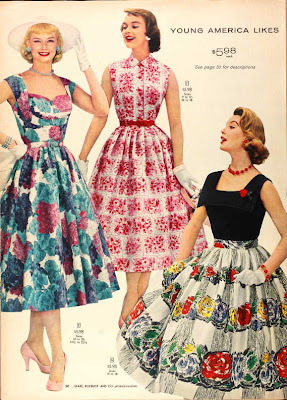 love the dresses on this page, charming and lady like. I wonder if I can wear any of these in one of the occasions. Would be great to try wearing this in one of the parties these days.